Communication is key when it comes to engaging a community of over 35,000 people in a global and remote environment. Keeping track of everything in the Kubernetes community can be an overwhelming task. On one hand we have our official resources, like Stack Overflow, GitHub, and the mailing lists, and on the other we have more ephemeral resources like Slack, where you can hop in, chat with someone, and then go on your merry way. Slack is great for casual and timely conversations and keeping up with other community members, but communication can’t be easily referenced in the future. Plus it can be hard to raise your hand in a room filled with 35,000 participants and find a voice. Mailing lists are useful when trying to reach a specific group of people with a particular ask and want to keep track of responses on the thread, but can be daunting with a large amount of people. Stack Overflow and GitHub are ideal for collaborating on projects or questions that involve code and need to be searchable in the future, but certain topics like “What’s your favorite CI/CD tool” or “Kubectl tips and tricks” are offtopic there. Right off the bat we have categories that users can browse. Checking and posting in these categories allow users to participate in things they might be interested in without having to commit to subscribing to a list. Granular notification controls allow the users to subscribe to just the category or tag they want, and allow for responding to topics via email. Ecosystem partners and developers now have a place where they can announce projects that they’re working on to users without wondering if it would be offtopic on an official list. We can make this place be not just about core Kubernetes, but about the hundreds of wonderful tools our community is building. 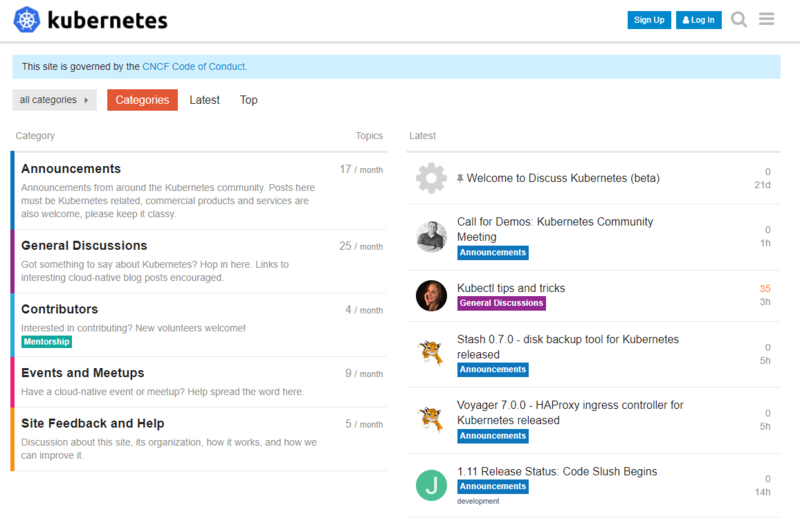 This new community forum gives people a place to go where they can discuss Kubernetes, and a sounding board for developers to make announcements of things happening around Kubernetes, all while being searchable and easily accessible to a wider audience. Hop in and take a look. We’re just getting started, so you might want to begin by introducing yourself and then browsing around. Apps are also available for Android and iOS.